Born in Edinburgh, Louise studied psychology at Strathclyde University, before working in business for some time and then enrolling at Newcastle University as a Fine Artist. Upon completing her studies, Mackenzie exhibited at Synthesis, Manchester Science Festival, and received the New Graduate Award for her installation, ‘Life Support (2013)’; an “elaborate play on the relationship between art and science”. Mackenzie’s studies into the field of psychology have fundamentally shaped her artistic practice. Through artistic, scientific and theological search for meaning amongst existence, Mackenzie’s work is an exploration of the human psyche. It was the human aspects of the organ’s legacy that steered the course of this project. 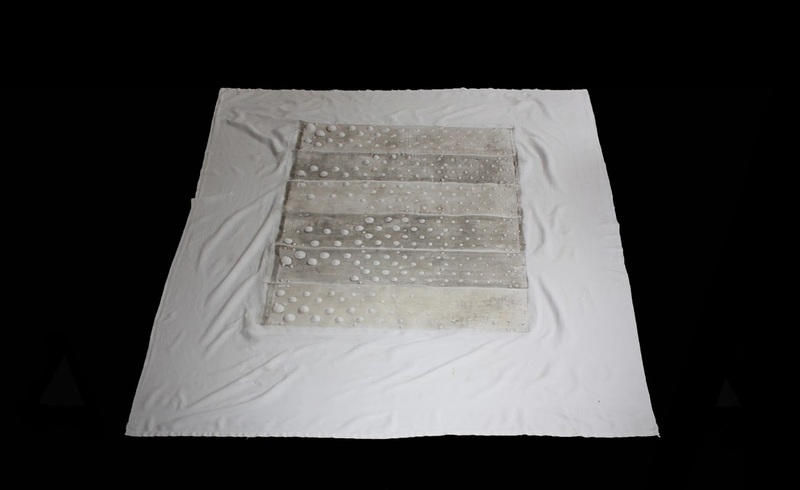 Mackenzie depicts the dust itself; imprinted onto a cotton sheet donated by the church organists’ widow. Poetically named, ‘Lament’, it makes for a harrowing print that seems to seek to re-connect the deceased organist with his instrument. Mackenzie senses an emptiness in the wake of post-modernism, seeing her practice as in pursuit of the new, the unknown. Her aptitude to find beauty in the everyday means it is little surprise to discover her appreciation of the Arte Povera (Poor Art) movement. In post-war Italy; a period of economic and social turmoil, a group of radical Italian artists began attacking the established industries of government, through unconventional style and material. Through sculpture, photography and installation, the Arte Povera artists transformed from everyday objects. In Louise’s practice, physical objects are often a starting point; which then go on to initiate the unexpected. Evoking notes on a stave, the circular holes in the organ wood that once embraced singing pipes now reveal a new composition: entropy (a term coined by German physicist Rudolf Clausius, as a way to define the transformation content of a body). From a system devised by the artist, each hole is now colour coded according to size, replicating a musical beat. Collaborating with musicians from Newcastle University, this new composition was for the first time played live; performed at the Ryton Methodist Church in Gateshead on the 4th March. It will also be available via radio broadcast, daily, on basic.fm at 12:30 and within the Holy Biscuit Gallery space: an ideal time to plan your gallery visit. Mackenzie relays her interest of community within the context of contemporary art, questioning what makes ‘community’ today. In the technological age, there exists a new remote community; transient and digitalized. ‘Heartisanorgan’ is a social media website created by Mackenzie for the upcoming show. Containing photographs loaned from the former congregation of that same Church that delivered the organ. These digital images depict the pixelated faces of a nameless community. The former congregation and schoolchildren of Gateshead are invited to sign up to the site and share their memories, in turn giving the unnamed an identity in this digital age. Rather poetically, the regenerated Methodist organ returns to the former church, now contemporary art gallery, The Holy Biscuit. In a fitting finale, Louise has revived the once lifeless organ. It is now equipped with a new voice, a voice to sing it's final song. Transformation Content previews at Holy Biscuit Gallery 6th March. 1 Philosophical Society of Zurich on the 24th of April, 1865, Bd. x. S. 1.; Pogg. Ann. July, 1865, Bd. cxxv. S. 353; Journ. de Liouville, 2e ser. t. x. p. 361.